"... I have been using Dr. Marshall's products for 4-6 months. I had a FABULOUS moult, and have now got two clutches of babies from younger, first time moms. All is looking good. If they were gonna pitch these babies, they would have done so by now. 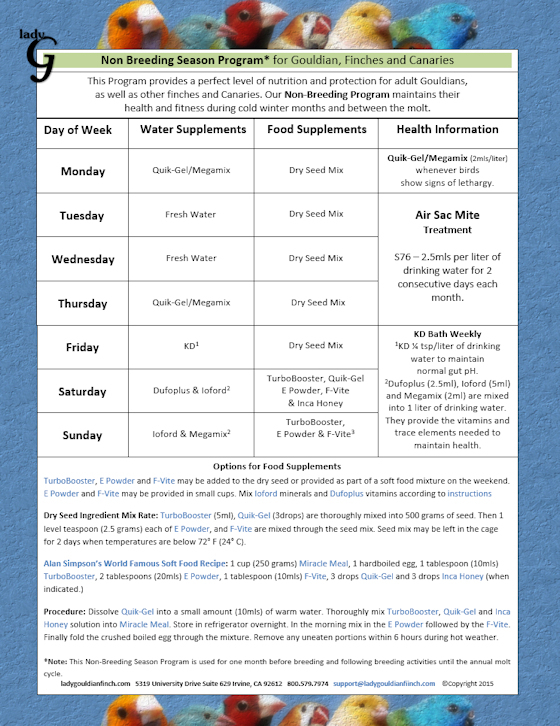 I have to attribute it ( the success) to these supplements. Keep up the good work!" "..I have noticed my Ladies are more active since I have been using Dr. Marshall's products. My Ladies love the F-Vite and E-Powder. I give it to them free choice and have to refill the dish every other day. Hence the BIGGER order the other week...LOL"
"...This year's Chicks are healthier than ever"
"...Their feathers are brighter, tighter than ever before"
"...Our birds are more energetic and sing more"
Our clients tell us all the time how pleased they are with Dr Marshall's Health Products. 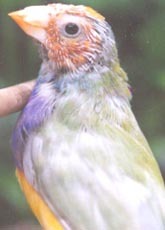 We guarantee that if you use Dr. Marshall's Health Programs, you will see not only wonderfully healthy birds, but also simplicity of feeding, especially with Gouldians who can be finicky eaters. With our busy life styles we want an easy way to maintain our birds. 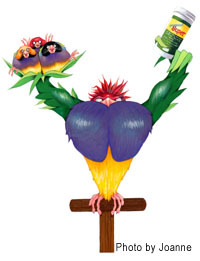 Dr Marshall's products will keep your birds healthy, happy and capable of raising strong healthy chicks! The frequency of use of Dr Marshall's products change throughout the Resting, Molting, Breeding and Juvenile seasons, however the core products remain the same. The following charts illustrate the product frequency changes during each Seasonal Cycle. During the Breeding Season when sprouted seeds and fresh egg mixtures are given to the birds, all of the supplements (TurboBooster, F-Vite and ePowder and even the DufoPlus and Ioford) are easily added to these mixtures. F-Vite and ePoweder should be offered �free choice� in separate treat cups during the Breeding Season. During the Resting phase each year when the birds should be on a pared down diet and not given such energy rich foods, adding the 3 core supplements (TurboBooster, F-Vite and ePowder) to the seeds on the appropriate days of each week is the most practical way to administering them. During this resting cycle, the DufoPlus and Ioford are best added to the drinking water. The TurboBooster coated seed should not be left in the feed dishes longer than 48 hours when temperatures are lower than 72 degrees Fahrenheit (25 degrees C) or no longer than 24 hours when temperatures go above 72 degrees Fahrenheit. The night before measure out the amount of seed that your birds will consume in a 24 hour period. Add the TurboBooster. The coating of the seed with TurboBooster should be done approximately 8 hours before feeding, allowing the TurboBooster to soak into the seed. The recommended amount of TurboBooster for Australian finches is 5ml to 500g of seed. Dosage rates for other species of birds can be found in Dr Marshall's books dealing with that species or on the supplement labels. It is not necessary for the TurboBooster to coat every seed. Using a fork spread the TurboBooster as evenly as possible throughout the seed. "...We doubled the number of chicks this year"
In the morning sprinkle 1 teaspoon of F-Vite and 1 teaspoon of ePowder on the top of the 2 cups of coated seed and using a fork blend and coat the seed. The F-Vite and ePowder will stick to every seed that has been coated with the TurboBooster. As the birds twirl the seed around in their beaks to crack the hull, these supplements are ingested. It's that simple! You can add greens and veggies several times per week during the Resting and Molting season and sprouted seeds and eggfood mixtures during the Breeding season. 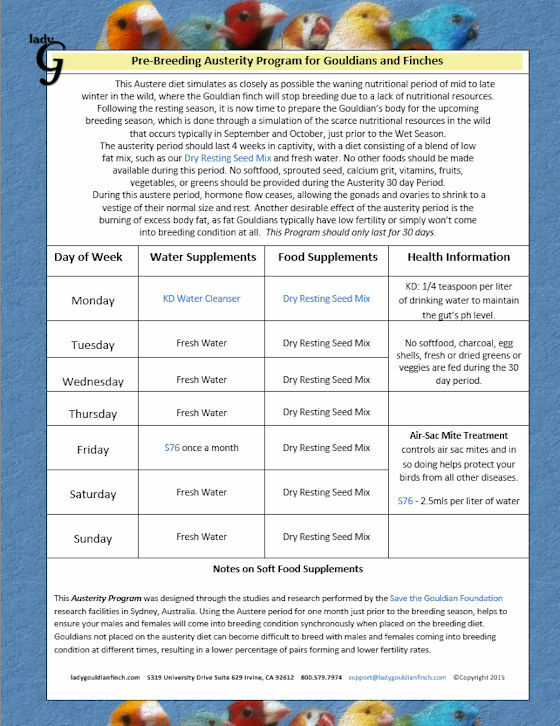 DufoPlus and Ioford are the sugar free liquid vitamin and mineral supplements that are added to the drinking water for varying numbers of days depending on the time of year and which �season� your birds are going through. These 2 supplements can also be mixed into the softfood or sprouted seed during the seasons when this type of food is recommended. 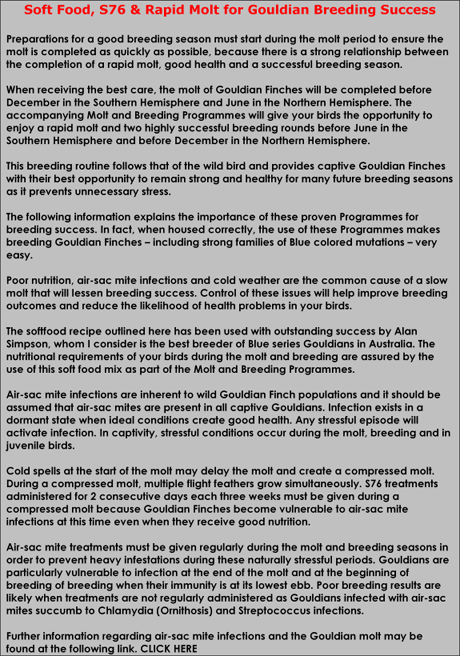 The 4 seasons listed by Dr Marshall are Resting, Molting, Breeding and Juvenile. 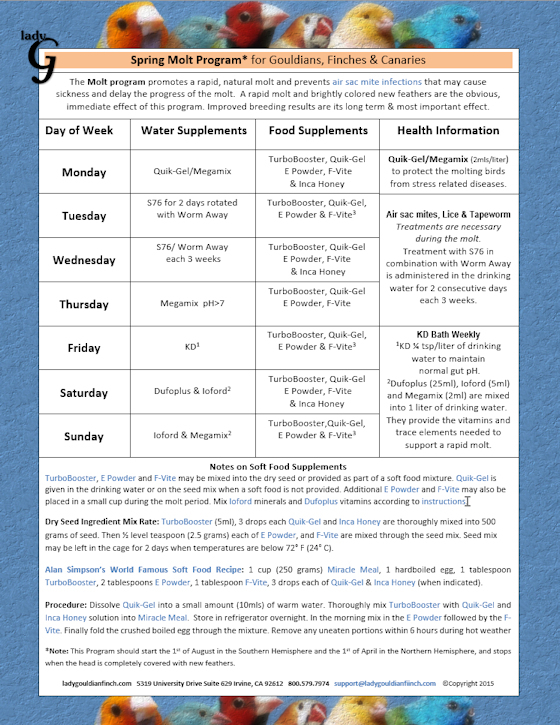 The complete schedule of use can be found in Dr Marshall's books, Gouldian & Finch Health (this book is out of print but is now available on line. Email Support@ladygouldianfinch.com and request your password into Dr Marshall's Client Only section of his web site. The mixing rates vary for Pigeons, Budgies and Hook-bills. Mixing rates are listed on the bottle labels or in Dr Marshall's books. They can also be found on Dr. Marshall's Pet Bird Care. 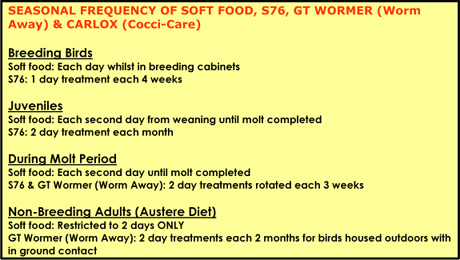 During all the Health Programs, the DufoPlus and Ioford are used together for 1 or 2 days, but in the Juvenile, Breeding and Molting Programs the Ioford is used alone for a second or third day. This is to provide the additional calcium, and minerals needed by the breeding hens, growing juveniles and for quality feather growth. 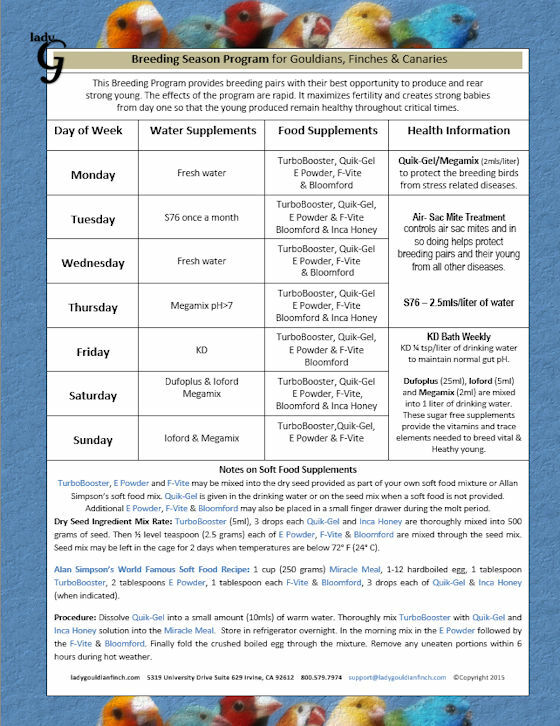 Both DufoPlus and Ioford should also be stored in the refrigerator upon receipt to ensure and protect the optimum quality of these supplements. Megamix and KD Water cleanser are health products designed to maintain a healthy flock by decreasing direct contamination through the ingested food and water. This in turn produces a dropping that has fewer germs; therefore, the environment is also kept cleaner. Megamix water additive prevents bacteria, mold and fungus (Thrush) from reproducing in the bird's drinking water. This is accomplished by lowering the pH of the water into a range where these harmful organisms do not like to exist. An added benefit is that the drinkers remain free of sludge and are sparkling clean. The main benefit, however, is that it cleanses everything the bird ingests into the crop, thus decreasing direct contamination through the food and water and preventing fermentation of foods fed to chicks until it can be absorbed by the digestive tract. The rest of the digestive tract is pH adjusted into the acidic range where it should naturally be which also protects the bird. One major benefit of using Megamix occurs when our pet birds are housed in very humid conditions on a daily basis. This will happen if they are housed outdoors in the southeastern US or near coastal waters, where the humidity can be in the 85%-90% range year round. It could also occur if your birds are housed in the basement of your home where humidity levels are usually higher than desired. A desirable range for pet birds would be 45%-50%. When birds are living in high humidity, the pH of their digestive tract rises into an unhealthy alkaline range which leaves them open to infection. The normal acidic state of a bird's gut is not a habitable condition for things like bacteria, fungus, mold and coccidian organisms. If these organisms are ingested by the bird, they simply pass on through without causing any problems. Once the gut begins to turn alkaline these foreign organisms can cause serious illness in birds that have not developed resistance to these �wet environment� diseases. This would include any species that has its' origins in dry, arid environments. Bacteria (E-coli and Strep), mold, fungus (Thrush) and Coccidia thrive in humid conditions. The birds have the possibility of ingesting these airborne toxins, which may have settled on their food and into their drinking water or simply by spending time on the ground where these organisms can live. Even in indoor aviaries and cages it is especially important to prevent water drinkers from leaking and causing damp places on the ground and cage floors because any moisture will provide excellent conditions for the colonies to multiply. The amount of Megamix used will vary from aviary to aviary based upon the alkalinity of the local water. Normal city tap water has a pH of about 7.5 when it is full of chloramines. The pH will rise with more chloramines added. Therefore, city tap water predisposes a bird to bacterial, mold and thrush growth on food and water ingested into the crop. Clients with a pH of 8.5 use Megamix in the drinking water on all days that the KD water cleanser isn't being used. The normal crop of a bird has a pH of 4; the proventriculus about pH2; intestines and cloacae around pH 6.5-7. Megamix in normal tap water (approx. pH7.5) lowers the pH to 5.3 to 5.4. Therefore, if the normal drinking water has an even higher pH than 7.5, the addition of more Megamix will be necessary to bring the pH into the 5.3 to 5.4 range. The amount of Megamix needed can be determined by observation of the droppings, in a normal healthy bird, the droppings should be tight and well formed with just a small amount of water ring around them. Dr Marshall recommends starting with 3ml of Megamix per liter of water. Observe the droppings for several days and adjust the amount of Megamix up to 2ml increments until the droppings are normal. Megamix can be used on days when KD water cleanser is not being used. 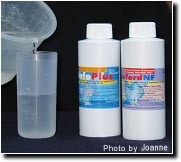 It is totally compatible with the DufoPlus and Ioford and S76 treatment for airsac mites. Megamix and KD Water cleanser, are health products designed to maintain a healthy flock by decreasing direct contamination through the ingested food and water. This in turn produces a dropping that has fewer germs; therefore, the environment is also kept cleaner. A clean environment is of great benefit when there are fledged juveniles who are just learning to eat on their own. Chicks hunt and peck around on the floor eating whatever looks like food. To them, dropping are just as edible as seed. At this critical stage they have a very immature immune system so they do not need to be stressed by intake of harmful organisms that may be contained in these droppings. Both Megamix and KD allow the immune system of the young birds to develop naturally without constant medications. KD Water Cleanser is used for 2 consecutive days each week to thoroughly cleanse the digestive tract of the bird. KD should never be mixed with any other product or supplement. KD is active against Steep. E-coli, Thrush, fungus and viral infections without affecting the immune system. 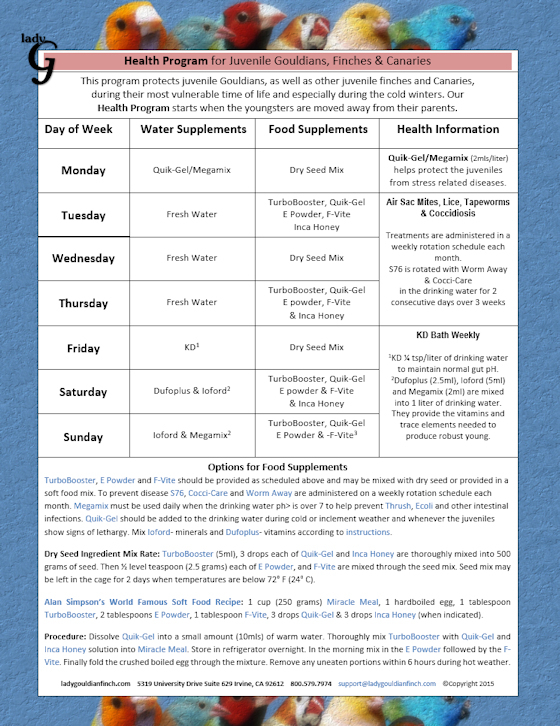 In some cases you may find that KD is only needed for 1 day each week. This can be determined by observing the noise and activity level of your birds as the start of the 1st day of KD. If on the morning of the 2nd day you find that the noise and activity has increased then the KD should be left for the 2nd day. If however the birds seem quiet or depressed, the KD should be removed and replaced with fresh water or fresh water. The KD water should also be replaced if the droppings have turned musky and green. Both scenarios are an indication that the flock is healthy and may only need the KD for 1 day every 2, 3 or 4 weeks instead of every week. KD Water Cleans also makes an excellent soaking solution for soaking seed. It is mixed at the same rate that is used for the drinking water, � teaspoon per liter of water. KD may also be used as a disinfectant strength (1 teaspoon per liter of water) to wash hand feeding tools or to clean trays and cages. It leaves no soap residue like dishwashing products. KD Water Cleanser can also be added to the bath water, at the drinking water strength (1/4 teaspoon per liter of water), to wash away any debris and leave sparkling clean feathers. Dr Marshall's Health Products will pay for themselves many times over with the increase in your bird's health, happiness, and well being. The increased numbers of chicks each year will pay many times over for the products. Not to mention your savings in vet bills! NOTE: Dr. Marshall's Health Products should be refrigerated both before and after opening to ensure the optimum quality of the supplements.